All Digitrax decoders are tested for proper operation before they leave the factory, but sometimes strange things happen. Therefore to insure your decoder is covered under our warranty policy, please give it a thorough test BEFORE you cut the wires. Be sure it runs correctly in both directions with no unusual noises or binding in the motor-gear train. DECODER TESTER - Such as the one that came with your Digitrax system or any other RELIABLE DCC decoder tester. 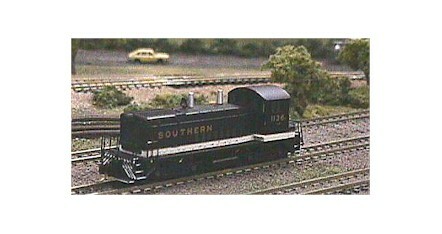 PARTS LIST - The one that came with your locomotive. PARTS CONTAINER - Something to keep the parts in so the won't get lost. The box the locomotive came in or a small zip top bag will work fine. MARKER PEN - One that will mark on metal and plastic. Please Note: This installation will not allow you to keep the headlight feature, however you will be able to retain nearly all of the weight of the locomotive which is very important with a locomotive of this small size. Put ALL of the parts into your parts container as they are removed in the following steps. Referring to the parts list and disassembly instructions that came with your locomotive, gently pull out the top ends only of the hand rails on both sides of the cab rear door. While gently rocking the cab, pull it straight up and off. Remove the weight found inside the cab. Remove the plastic fuel tank cover by pulling it straight away from the frame. Grasp the frame in one hand and the walkway/shell combination in the other and carefully pull the two apart. The trucks may now be removed by rotating slightly and lifting them out. (They will practically fall out at this point.) Pay attention to their orientation with respect to the frame in order to reassemble them properly later. 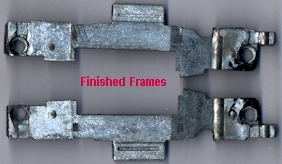 Remove the plastic screw head covers and the screws holding the frame halves together. Remove the small printed circuit light board and the two insulating frame separator/spacers. Very important: Before removing the motor, make a PERMANENT mark on the TOP of the motor so you will know which wire to connect where and how to re-install it. Snap the motor carefully out of its plastic mounting frame. You will find a small phosphor-bronze contact tab at each motor brush cap. With your pliers, grasp the tab and pull each one straight out from under the brush cap. Be careful not to bend them, as they will be used in another manner later. Inside the brush caps are the carbon brushes and small delicate springs. CAREFULLY grasp the brush caps with your pliers and gently pull them straight out from the motor. They are "snapped" in place and a slight rocking while pulling motion will free them. Do this carefully so as not to loose the small springs inside nor to bend the cap out of shape. Believe me, the springs are nearly impossible to find if they hit the floor!!! Be sure all of the parts except for the frame halves are in your parts container and close it up. At the front end of each frame half, you will see a groove which held the light board. When making the modification described below, be sure not to remove any metal below the BOTTOM of this slot. Referring to the picture above, mark the area to be cut away on each frame half. You may find it useful to clamp the frame half in a small vise to hold it while doing the cutting. Be sure there are no sharp edges left which could cut through the insulation of wires or the plastic wrapper of the decoder. Temporarily reassemble the frame halves, motor, motor mounting frame and insulating spacers with the screws and plastic nuts. Tighten the screws only until they are just barely snug to keep the motor from falling out. Notice that on one side of the DZ121 there is a large square bump at the opposite end from the wires. This side of the decoder will be down to fit properly when installed. Cut off the BLUE, WHITE and YELLOW lighting wires as close to the decoder as possible. They are not used in this installation. Be sure the exposed ends can not touch anything when the decoder is installed. You may need to trim the shrink wrap back on the ends of the decoder. Do this very carefully with a sharp blade in your hobby knife. Be very careful not to cut the wires or their insulation with the hobby knife. Cut the GRAY wire to 1 3/8" (35 mm). Cut the RED, BLACK and ORANGE wires to 1 1/8" (28 mm). Strip about 1/16" (2 mm) of the insulation off all of the wires and apply a small amount of solder to tin them. Apply a small amount of solder in the groove on the top edge of both brush caps. DO NOT ATTEMPT TO DO THIS WITH THE CAP ON THE MOTOR!!! THE PLASTIC MOTOR HOUSING WILL MELT AND DISTORT AT A VERY LOW TEMPERATURE AND WILL BE RUINED!!! Cut one of the "ears" off each of the phosphor bronze brush cap clips and solder one to the RED wire and one to the BLACK wire bending the remaining "ear" on each clip over the wire. Take the screws and nuts out of the frame halves and remove the motor from it's mounting clip. Install the brush, spring and cap attached to the GRAY wire in the bottom brush opening of the motor. Keep it against the frame and out of the way of the motor worm gear and out of the way of the truck gears with a dab of 'goo' (later). The GRAY wire is routed through the end of the motor mounting clip and beside the motor shaft to the top side of the locomotive. Clip the motor back in it's mounting clip. Install the ORANGE wire, remaining brush cap and brush and spring in th top motor brush opening. Be sure there are no wire "whiskers" that could contact the locomotive frame. Wires can be "shortened" after assembly by rotating the brush cap to take up a bit of the slack. Reassemble the motor, mounting clip, insulating separators and frame halves with the two screws and plastic nuts. SNUG BUT NOT TOO TIGHT!!! Slip the phosphor bronze clip with the RED wire attached down between the plastic part of the motor and plastic motor mounting clip. The end of it will contact the right metal frame half (engineer's side) when assembly is complete next to, but not touching the brush cap. Install the clip with the BLACK wire similarly on the left (fireman's side). Be sure there is no contact between either of the brush caps, their wires nor metal parts of the motor and either of the clips attached to the RED and BLACK wires or you will have SMOKE!!! 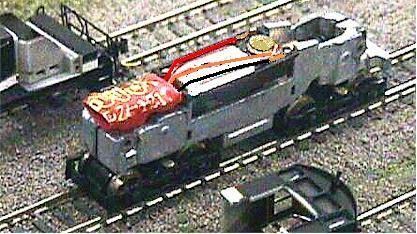 Place the locomotive on your DCC track and check that it runs OK in both directions with no binding or unusual noises. (Due to the track power pickup configuration, it won't run without the shell in place!) If all is well, put the weight and cab back in place and enjoy.